"The Lion mine [At Stockton, Utah] owned by C.E. Mitchener is being operated by Hickman & Booth under lease who in the past two months have shipped 40 tons of $40 ore, with only two men working." --Salt Lake Tribune, Jan 1 1890. "W.G. Hickman returned home Thursday afternoon from a months trip to San Juan county where he went with supplies to their sheep camp. He traversed the county from Thompson's Springs to Bluff City and declares it to be the most excellent sheep range in the Territory. Mr. Hickman states that this section is inhabited by the toughest lot of people in the West and that it is the refuge to outlaws of every description." --Nephi Courier, quoted in Park Record, Nov 25 1893. Eureka, June 25--W.G. Hickman who died at his home here June 23, was born in Missouri, June 27, 1844, the day the Prophet Joseph Smith was martyred. 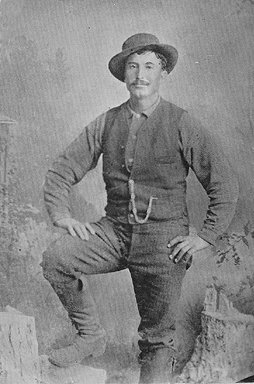 He came to Utah with his parents in the fall of 1847, living for many years in what is known now as Taylorsville. He handled horses many years for Bishop Thomas Jenkins. Mr. Hickman was considered one of the best judges of a horse in the state of Utah. In 1860 he married Emma Jane Hague, who survives him. From this union there were 12 children, six boys and six girls. The following are now living: Mrs. Gus J. Henriod, Mrs. William Whitbeck, E.P. 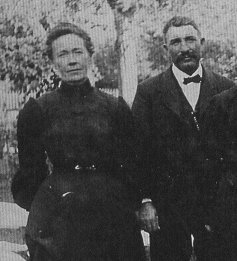 Hickman, Mrs. Charles Delahoyde, Burckhartt Hickman and Mrs. Gussie Moore. All are living in the state, four of them in Eureka and two at Vernal. In 1861 Mr. Hickman was called as a missionary to Missouri, but owing to the breaking out of the Civil war, was compelled to return after being a federal prisoner for five days. He conducted a livery stable in Nephi for many years. The family moved to Tintic in 1896 and has lived here ever since. The last eight years Mr. Hickman was in charge of the old Colony mine as watchman. In addition to his wife and children, he leaves a host of relatives, children, grandchildren, great grandchildren, brothers and sisters. The funeral was held at the residence June 25, under the direction of Elder E.W. Redmond, assisted by Dr. E.J. Howell and Elder Geo. A. Udahl. Members of the Eureka ward choir rendered music. The floral decorations, compliments of relatives and friends, were numeous and beautiful. Marshall D.N. Hickman of Milford, a brother of deceased, and about 50 other relatives were present, and a host of friends of the family followed the remains to the Eureka cemetery where interment took place. by Jerry and Linda Glenn of Sepulveda, California. Ruth and her husband Gus Henriod. Gus was sheriff of Eureka, Utah. Beginning in 1876, Joseph Smith III (1832-1914), the Prophet of the Reorganized Church of Jesus Christ of Latter-day Saints made several trips to Utah. On one such visit in 1885 he got to know Bill Hickman's oldest son, and could see first-hand the damage that had been done to the family by the book Brigham's Destroying Angel. For President Smith, the problem was simple: these people belonged to the wrong church. It was Wednesday, November 4, when Brother Luff and I left Springville for Nephi, commonly called Salt Creek. There we were located at Brother Christian Larson's who made us welcome. The following day I visited Brother W. George Hickman and family. He was the son of the notorious "Bill" Hickman who was associated with the Huntingtons and others in what was called the "Danite bands." As a boy in Nauvoo, I had known William Hickman by sight and remember that on the morning the body of Ervine Hodges was taken from where it had been murdered--on the lawn near the home of Brigham Young, by someone as yet unknown to justice--I had seen him in the curious crowd which followed the body to the Hodges home. We found Brother George and his family very pleasantly situated, and I was well pleased to meet him . . . .
We were met at Nephi in the afternoon by Brother W. George Hickman, through whose influence and that of Brother Coleman arrangements had been made for services. They were to be held in a hall, a stone building, which was under the control of a Mr. William Bryant, a clerk, of the court, and located very near his residence. Whoever had taken the pains to secure this building had failed to think of and make provision for lighting it, but through the kindness of Mr. Bryant after we reached the place, a stand and a lamp from his house were brought in. This one lamp, a poor one at that, was all the light we had, and there seemed something about the semi-darkness which struck me as minous. I confess now that it was with a feeling germane to distrust or fear that I essayed to preach there that evening. The house was packed full, though comparatively few women were present. The congregation seemed inclined to be noisy, even hilarious, as if they thought hearing "the Prophet's son" was considerable of a lark! Under all these conditions that prevailed had it not been for the earnest faces of Sister Larson's family and those of Brethren Coleman and Hickman, together with the strong moral support of Mr. Bryant which I sensed, I should have failed in my effort and have left the room. However, conscious of their confidence, I managed to overcome my nervousness, rally my powers, and enter upon a discussion of that which was presented to me. After a little while I forgot every untoward thing, concentrated my attention upon my subject and my duty in the premises, and soon discovered that the mocking spirit of the audience which had appeared against me--so clearly felt--had but served to quicken my higher powers. I swept into an examination of some of the differences between the Utah Church and my own which at once secured for me what I had but little expected--quiet and respectful attention . . . . Brother Coleman took us to Nephi, where I became the guest of Brother W. G. Hickman. He was not at home when we arrived, for he was out on a search for some of his horses which had gone astray--or had been stolen, as it was known he was not a very strong Mormon. He came home before bedtime, and we noticed that the horse he had been riding during his search--"Bennie," he called him--was quite sore from the unusual strain put upon him and was really ill. We worked over the animal solicitously, but it was not until two o'clock in the morning that we succeeded in rallying him and making him comfortable. While thus helping attend the stricken beast I seemed to find my way into the heart of this son of William ("Bill") Hickman, and discovered he was making a manly struggle to overcome the evil memory of his father's career. The circumstances of that father's life had separated the family from the Mormon circles. They firmly believed that what Bill Hickman became that was reprehensible in those later years was the direct result of the guidance and instructions he had received from the presiding authorities of that church, especially from President Brigham Young, whose bidding the "Danites" were expected to perform at all hazards to themselves and without question. I sympathized with this man, the son, and did not wonder at the position he had taken against those leaders who he felt were responsible for his father's wrongdoing. I was forcibly reminded of my own circumstances and the course I had taken in early manhood when I formed the firm intention and sacred purpose of living honorably enough to redeem my father's name from the curse of opprobrium and detestation which had been cast upon it by the evil stories his enemies put in circulation about him and his work, and by the equally blighting false assertions made by these very leaders-his fellow religionists who had gone grossly astray from the truths and principles he presented and maintained during his lifetime. Thus, in a way and to a certain degree I could sense the nature of the struggle this young man had undertaken. It seemed he had been made an object of suspicion by the Mormons surrounding him, simply because in his efforts to lead an honest, upright life and to keep his family in the way of rectitude, he did not subscribe to the standards of that strange quasi-respectability commonly accepted or winked at by those who taught or believed in the philosophy of marriage current in that locality. Instead, he was trying to live in accordance with the standards of respectability contained in the code of morals found [p.257] in good society and in the ethical teachings of the New Testament Scriptures. Appreciating his confidences and the revealments of his ideals, I was constrained to give him my hand in token of my sympathetic understanding of his problems, and bid him be faithful, strong, and of good cheer. I felt the more justified in thus extending my friendship to him because I knew by just report that his father's family had early been one of excellent repute and standing in the northern part of Missouri, before that father united with the church, and also because I, too, felt convinced that whatever he may have done of an evil nature in those early western days, Bill Hickman did it through misguided religious zeal after he had accepted the leadership of Brigham Young and had subscribed to that pernicious doctrine which taught him that it was his duty to do whatever the "Prophet" told him to do, without question or regard to consequences. "Father, forgive them; they know not what they do." Being impressed with these ideas, he could only trust his case to the clemency of the Spirit of the Lord which leads us to hope, as taught in the Book of Mormon, that through the mercy of Christ it is possible there will ultimately be a redemption for every soul, even those stained by darkest crimes. I was warmed in heart by my talk with the son of this unfortunate wrongdoer, and parted from him in friendship and sympathy. I may add, here, that after the death of Brigham Young-and possibly as a partial result of the bloody Mountain Meadow massacre and its publicity-there ensued a change in the administrative policies of the Mormon Church, and the Danite band was put out of existence. pp 249, 254, 256, 257. To learn more about Joseph Smith III, click here. To read the Memoirs of Joseph Smith III online, click here. To learn more about the Church of Jesus Christ of Latter-day Saints, click here or here. The Reorganized LDS Church recently changed its name to Community of Christ; click here. To return the the Hickman Family index page, click here.